Chief Executive Officer Mike Delfs joined Jamestown Regional Medical Center in spring 2019. Delfs is a Langdon, N.D., native with many years of experience in the Upper Midwest. 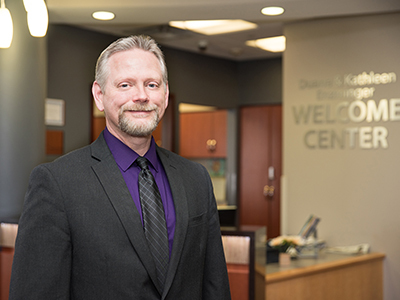 He began his career as a certified nursing assistant and gradually worked his way to CEO, most recently at Mercy Hospital, a critical access hospital in Moose Lake, Minn.
Jamestown Regional Medical Center has a ton of opportunity. I am interested in JRMC because its service lines are similar to my previous employer and I know I can help develop them. I was also attracted to JRMC’s excellent culture, award-winning care and because JRMC is a Best Place to Work. Jamestown is also closer to home and grandchildren. It is seldom when personal and professional goals line up so well, however, that is what happened in this case. Prior to my start in healthcare, my wife and I ran a restaurant in Wahpeton, N.D. After we sold it, I needed work to support our two children. I enjoyed serving as a certified nursing assistant because I connected to helping people who really needed it. After working as a CNA for two years, my organization promoted me to a supervisor. A passion ignited in me while in the supervisor role, so I finished my bachelor’s and master’s degrees so I could continue to serve others. Starting in that area of healthcare gives me a unique perspective. Not many CEOs started as a CNA. My background helps me connect with and support each department in the hospital. What is the future for JRMC? I see JRMC remaining independent because that is what is best for the patient. JRMC can do that because we have a strong focus and a shared belief. Already, we are accomplishing amazing and special things like our specialty clinic. This community is fortunate to have so many specialists practicing in this rural area. While I see JRMC remaining independent, I also envision more partnerships. JRMC is not an island and we rely on other healthcare organizations to provide the care we cannot. Those partnerships require trust. We are grateful for the amazing, gracious and talented medical community here. Do you feel at home in Jamestown? I do! Already, my wife and I moved into a new home. Our neighbors are kind. We feel very welcome. I look forward to getting involved with community groups like service clubs, the Jamestown Area Chamber of Commerce and others. I also look forward to getting to know the employees at JRMC. My 90-day goals include building both business and service lines, but also relationships. When I’m not working, I enjoy walking with my wife, spending time with our dogs and riding my motorcycle.